ASTHA UV-106M10 Professional Counterfeit Note Detector Machine has powerful Fake Money Detection System checks ultraviolet light detector, magnetic detection, fluorescent light for watermark verification function and micro-printing security features. 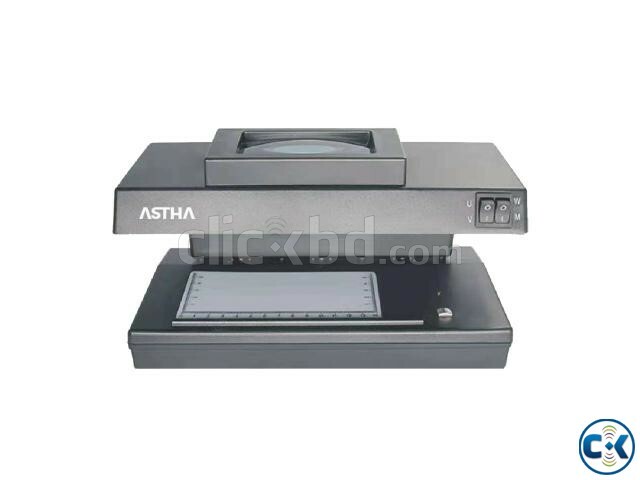 Additionally, the large magnifier for micro-printing verification, folding stand for angled viewing, counterfeit banknotes / ID card and bills detection, UV detection, magnify glass, white light and MG detection, counterfeit detector is equipped with an auto on/off sensor, an enlarged magnifying glass and with the capabilities of checking check for ultraviolet and watermark features simultaneously. This analyzer includes a folding stand for angled viewing for convenience and to protect the user from UV-ray exposure. Protect your money for banks, Small Offices, Shop, Bars, Gas Stations, Nightclubs, Restaurants, Movie Theaters and anywhere cash Transactions take place. Check the authenticity of money and credit cards, trace all types of fluorescent marks. Support multiple paper currency in the world. Can also detect credit/debit/ID cards, passports, driving licenses and other official documents.